Highgrade specialized in LCD Monitor ARM, LCD Monitor Stand, LCD TV wall mount bracket, Height Adjust Stand, Projector Mount. We insist of providing High quality with reasonable pricing for customer's choice. The Unique design and reasonable price makes us outstanding from the competitors. Tilt Monitor Arm AR011 is desined with spec of 100 x 100 / 75 x75 mm. 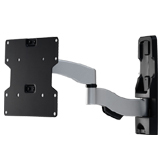 AR011 is one of our LCD Monitor arm which inherited with the know how on hinge works of Highgrade. Highgrade has developed universal modules with designated swivel, Tilt, & rotation functions.